Having finally found the time to clear my kitchen sink on Saturday (it’s taken weeks), it was time to fill it right back up again on Sunday..
All of these recipes will be coming to you soon, as today, I remembered to charge my camera (and the kitchen was tidy) so therefore I have photos to share. Just for now I’ll share you the most amazing and quick to make chocolate icing- it was a HUGE hit with the children. I’ve just stumbled across your blog and I’m really enjoying looking back over the old posts. The food looks lovely. This icing makes me want to wipe my finger across and lick it! I love the tablecloth you have in the pictures. Where did you get it? HOWEVER a friend told me recently that you can pick these tea towels and kitchen aprons with the same design on from eBay very cheaply indeed for just a few quid!!! I have just discovered your site! Very interesting as mine is along the same lines, not in the kitchen so much, but in the garden. 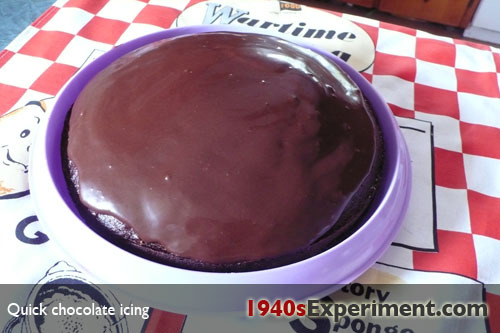 I will put a link to your site as l want to expand my ‘kitchen front’ link to include recipes used during the war. we are making this for our class…and we would like to add spam spam spam spam is that gross?